The biggest challenge I faced after starting my healthy hair journey was monitoring the protein and moisture balance. My hair was doing fine in the beginning. But over time, I started to notice excessive breakage. My hair felt hard and crunchy after each wash. And no matter what I did, I could not get my hair to stay moisturized. I can say without any reservation that my breakage was due to using too much protein on my hair. Or as some would say, "I suffered from protein overload." A diet low in protein can also damage the hair. 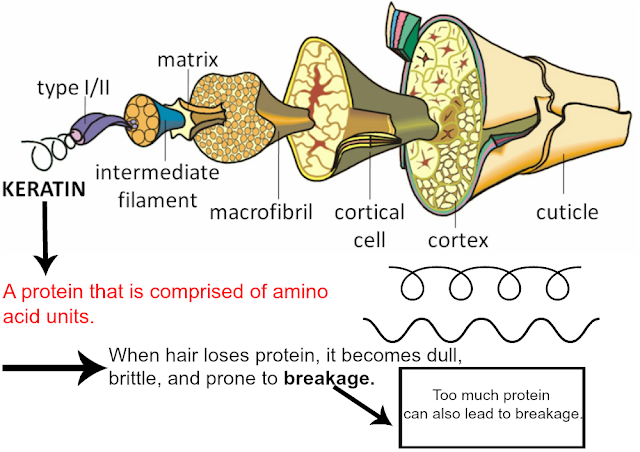 Your hair can get its protein either internally or externally. The important thing is to know when enough is enough. When your hair is in its natural state (not chemically treated), little protein is required for it to thrive. According to WebMD, Not eating enough protein can result in shedding and breakage. 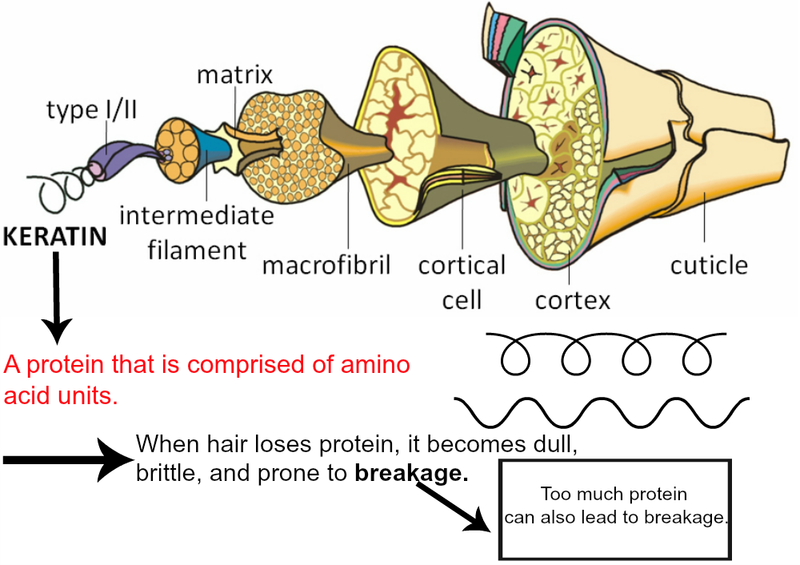 If the body does not have enough protein to function properly, it will save protein by sending the hair cycle into the resting phase. If you've been wondering why your hair stopped growing lately, this just might answer your question. From your hair all the way to your last toe nail, protein is very important. The protein found in the hair is called Keratin. Keratinocytes are responsible to make this protein because it is essential to hair growth. When Keratin is not present, the hair becomes dull, brittle, and susceptible to breakage. Chemicals in certain hair products and hot hair tools can also cause the hair to lose its protein. Not eating a diet consisting of 2-3 servings of protein a day can lead to hair damage and breakage. 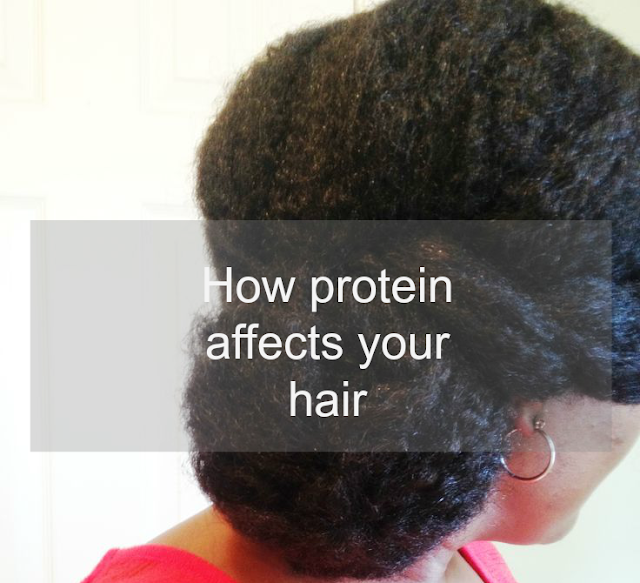 Did you know that protein can affect the hair texture? According to a study published in the "Journal of Investigative Dermatology" in February 2011, binding protein determines whether the hair is curly or straight. Hair care products with added protein are formulated to strengthen the hair shaft. Keep in mind that some hair products will coat the hair instead of adding protein to the hair shaft. In order for the hair to get the amount of protein necessary, the cuticle layers must be lifted. If you have thin hair, heat can be used to ensure the complete penetration of the protein. According Dr. Lawrence Shapiro, a hair transplant surgeon based in Florida, eating whey protein can be very beneficial for the hair. He conducted a study in March of 2010 on the effects of drinking a whey protein beverage made from concentrated whey protein and other nutrients. The results of this study is listed on his website. Whey protein can also be found in some shampoos. TREsemme moisture rich shampoo used to contain whey protein, but the latest formula doesn't. My daughter had a severe allergic reaction to this particular shampoo a few years ago because she is allergic to dairy products. In conclusion, as you learn the texture of your hair and how much protein it needs, eating a protein rich diet or adding regular protein treatments to your hair regimen, will help you retain your length. The biggest setback that I had to deal with since I started my hair journey was caused by protein overload. I hope you learn from my mistakes.